I stood in the back of the Great Hall, its high, vaulted ceilings reverberating with the lively chatter of students awaiting a global health talk on health and climate change. Among the anticipated speakers was Dr. Veerabhadran Ramanathan, a Scripps Institute of Oceanography climate scientist who advised Pope Francis on the moral issues of climate change, poverty and food security. The professor’s title and history hold an impressive weight that is belied by his form of a small, older Indian man. Ramanathan, who likes to be called “Dr. Ram” for short, began speaking in a shaky, quiet voice prone to mumbling. His habit of letting the microphone drift away from his face meant his words would cut in and out, but even so, his message was clear: We need to make climate change personal in order for people to care. Climate Lab is a video series collaboration between the UC system and Vox Media, which aims to engage viewers in understanding climate change and the ways we can help mitigate its effects in an approachable and friendly way. The first video, “Why humans are so bad at thinking about climate change,” introduces the series’ charismatic host, conservation scientist Dr. Muttulingam Sanjayan, who emphasizes that we should not use “doom-and-gloom” messaging. Instead, we should utilize playful and engaging dialogue paired with concrete and accessible actions. The video seemed like an answer to Ramanathan’s question of how we can talk about climate change and even expanded upon it: We should be personal but also playful. As a whole, the University of California has committed to several sustainability-minded goals; in 2013, the UC Office of the President introduced the Carbon Neutrality Initiative in which we have committed to making each of our eight campuses carbon neutral by 2025. Other initiatives include improving food choices at campus diners to be healthier, locally-sourced and more sustainable; committing to all new buildings being LEED-certified, a marker of being energy efficient and made of sustainable materials; and reducing each campus’s consumption of potable water by 20 percent. There is also a history of significant student involvement in sustainability initiatives on their respective campuses. UC Santa Cruz’s Green Lab works toward improving energy efficiency and green-purchasing power through a student-run certification program and education and outreach efforts to students, staff and faculty. UC Santa Barbara has a wide range of research opportunities in areas such as environmental policy, urban planning and marine conservation for students to be involved in. The UC-wide movement to divest from fossil fuel companies has seen some success in the form of Academic Senate resolutions at UC Davis, UCSB and UC San Diego. This is in addition to the plethora of climate change research being done across the UC campuses. At UCSD’s Scripps Institute of Oceanography, work in biodiversity and conservation, environmental and human health and how ice is changing as a result of climate change has been happening for years. Notably, Scripp’s CO2 program continues the work of tracking carbon dioxide levels at Mauna Loa Observatory in Hawaii. The program, founded by Ralph Keeling, has produced one of climate science’s most well-known climate change graphs, named the Keeling Curve after its creator, that provides evidence for changing levels of carbon dioxide and how it affects our atmosphere. I wanted to understand the process behind the collaboration, the ways they sought to engage the public and how this series fit into the larger picture of the UC system’s climate action history. “We see Climate Lab as a very logical extension of that work, given our expertise and work in this area,” UC spokesperson Stephanie Beechem prefaced, framing the video series within previous work the UCOP has done on food waste, water policy and carbon neutrality. We both chuckle, familiar with the challenge of conveying the weight of climate change without leaving a crushing existential crisis in its wake. After a few short introductions, I began to delve into the process of the video collaboration with Vanessa Correa, the creative director, and Rana Freedman, the content marketing director at the UCOP. As someone who finds great joy in being able to create something that engages the community, I was curious to know how their experiences led them to their role in the video series and at the UCOP. Freedman’s past position as marketing director for “Lonely Planet,” a travel company that produces travel content, gave her the experiences of collaborating with big companies and media outlets such as Apple and CNN. One big aspect of Freedman’s job is to secure media partnerships for content. She pinpointed why Vox was the perfect choice. “They have the same mission that the University of California has around its research, which is trying to explain and deconstruct really complicated news and current events into ways that are really accessible and easy for people to understand,” Freedman emphasized. She also explained that while Vox and the UC system have not had an explicit partnership before, Vox was a fan of previous work the UC system has done, including a video series called “Fig. 1” that features UC researchers explaining their work through animations that make the content fun and accessible. Moreover, Vox’s excellent track record with video content and production as well as their huge audience made them an attractive media partner. I asked Correa to elaborate on the flip side of this partnership — coming up with the concept for a climate change series and how they brought it to Freedman to gain a wider audience. “I’ve always worked in issues-based marketing and design,” Correa said. She was a vice president at a communications firm in Chicago, which worked around specific campaigns for the city, before leaving to start her own firm. When she came to the University of California, she felt it was a natural transition to build her brand and tell a systemwide story. The video features a company called Opower, a subsidiary of Oracle that creates applications and easy-to-use interfaces that can track consumer’s usage of water and energy along with easy tips for reducing usage. It’s representative of the way the Climate Lab series wants to highlight technology as a way to make sustainable habits accessible and practical for people in their everyday lives. The video received 56,000 views in the first 48 hours on YouTube and over 101,000 views on Facebook. At the time of this article, the video now has 491,593 views. I commented that I even had a friend whose professor told them to watch the video in class, sparking a round of laughter, one of them saying, “Thank you for telling us that!” through her chuckles. I asked them to talk about the everyday workings of creating media in partnerships in order to understand how the two entities collaborated and what they each brought to the table. Correa explained that the UC system drove the editorial content and feel of the video, while Vox provided feedback. In addition to the videos, there is a plethora of other content on their website such as articles, quizzes on climate change, even quotes from other researchers that were not focused on in the videos. Freedman explained how they commissioned articles, illustrations and infographic content to continue the conversation in an engaging and innovative way. For example, they have a video on food waste that explores the vast amount of food thrown away from restaurants, grocery stores and dining halls that is still safe and edible but may be discarded because of aesthetic reasons or strict regulations. They expanded on this idea of unnecessarily strict labeling with an article about how the conservative estimates of expiration dates on food labels actually cause a great amount of food waste. I knew that they were both running a little late, so I put in one last question: How do you feel about climate change? The topic change and the scale of the question made everybody laugh again. Their goal of bringing important news to the public in an accessible and friendly way was reflected in their own personalities — even just 20 minutes of chatting with them conveyed that. Ramanathan, during the climate change talk at UCSD, had emphatically declared that Napolitano was “his hero” for putting forth the Carbon Neutrality Initiative. It seeks to connect the small, everyday actions of sustainability with the change it can create on a macro scale. The video delves into how the policies for businesses, like the carbon tax, need to be changed in order to hold them accountable for the products and pollution they produce so that the burden does not fall on consumers and government. The next video is set to release on May 3 and will discuss how smartphones impact the environment. 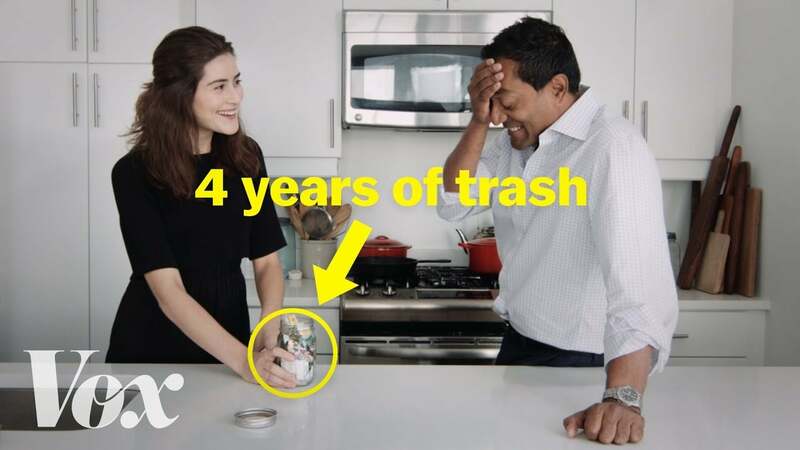 Each of these videos and their accompanying content seek to reach a specific niche of people: people who care about the environment and have tried to change their habits but may feel discouraged about the impact they are making. The platform of video content is uniquely suited to engaging many people — quite frankly, it’s much more fun and inspiring than looking at discouraging graphs or watching somber newscasters talk about the rising carbon-dioxide levels and disappearing rare species. It seeks to make sustainability habits into a fun and rewarding endeavor, not to vilify or victimize any one entity. Instead, it has the potential to open a productive dialogue on how the many players — individual consumers, businesses and the government — need to come together to create meaningful change. Ramanathan asked the question, “How do we make climate change personal to make people care?” According to Climate Lab, it’s not enough to be personal — we have to make it playful, too.